This is the exact same Amish oak tea cart shown on the previous page, but using natural light brings out the beauty of the light oak stain. You can see here the opposite side from the drawer is a decorative handle, useful for moving the tea cart around, or, for us males, a handy towel rack! 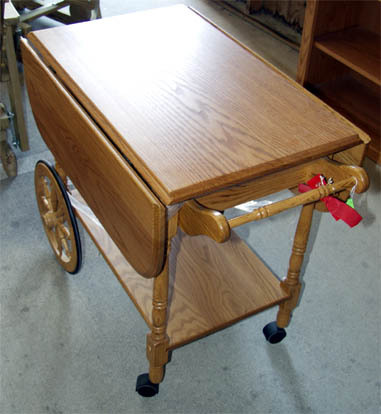 Our Amish tea cart will work great just as a way to move some food or beverages around, or it would also look great in front of that big bay window with several plants and a doily strategically positioned on top - especially a spider plant or something with long tendrils. You could also use it as a handy deck cart or out on the patio, but remember that this is a quality solid oak product, and as such would have to be protected from excess humidity (or rain) and kept out of direct sunlight so it doesn’t dry out - remember to bring it indoors when done!